Este artigo apresenta o desenho e implementação de uma Nova Abordagem de Ensino (NTA) da ligação química para estudantes do 1º ano do ensino secundário (16-18 anos). Para conceber e testar a proposta foram determinados, depois de tomar em consideração as preconceções dos alunos, vários aspetos-chave a respeito da ligação química. A NTA foi implementada num grupo experimental enquanto o de controlo foi ensinado com a metodologia tradicional. Depois de ser ensinada a ligação química, o mesmo teste abrangente foi aplicado a ambos os grupos e as respostas foram analisadas. Nos resultados, observa-se que as estratégias de ensino utilizadas e a NTA proposta permitem aos alunos desenvolver uma análise de pensamento mais elevado e um conhecimento mais profundo da ligação química, embora ainda alguns aspetos relacionados com o papel da energia na formação da ligação deva ser melhorado na NTA. Ce rapport montre la conception et la mise en œuvre d'une Nouvelle Approche de l'Enseignement (NTA) de la liaison chimique avec les élèves de 1ère année du secondaire (16-18 ans). Pour concevoir et tester la proposition, plusieurs aspects clés concernant la liaison chimique ont été déterminés après avoir pris en considération les idées préconçues des étudiants. La NTA a été mise en œuvre dans un groupe expérimental tandis que celui de contrôle recevait un enseignement suivant la méthodologie traditionnelle. Après la séquence d’enseignement sur la liaison chimique, le même test complet a été appliqué aux deux groupes et les réponses ont été analysées. Dans les conclusions, il est observé que la NTA proposée et les stratégies d'enseignement utilisées permettent aux élèves de développer une analyse plus approfondie et une connaissance plus profonde de la liaison chimique, bien que certains aspects concernant le rôle de l'énergie dans la formation de liaison doivent encore être améliorées dans la NTA. Chemical bonding is a fundamental concept in Chemistry. It is crucial to understand almost every topic such as inorganic and organic compounds, chemical energy and thermodynamics and chemical reactions (Fensham, 1975; Gillespie, 1997; Hurst, 2002). According to literature, chemical bonding is considered by chemistry students and teachers to be a very complicated topic (Gabel, 1996; Robinson, 2003; Taber, 1998, 2001a; Tsaparlis, 1997). The concepts associated with all types of chemical bonding are abstract and require students to be familiar with mathematical and physical concepts such as geometry, energy, stability, electrostatic forces, etc. One of the main objectives of the chemistry-teaching community is to develop more effective strategies to teach high-school students the central concept of chemical bonding. This is motivated by results observed in chemistry education that revealed that the traditional approach utilized in the teaching of this concept doesn’t have the required effectiveness (Teichert & Stacy, 2002). More specifically, researchers have found in the last two decades that students don’t reach a deep understanding of the key aspects regarding the bonding concept, develop alternative conceptions, and fail to connect their own mental models and build a coherent conceptual framework (Bodner & Domin, 1998; Griffiths & Preston, 1992; Herron, 1996; Peterson & Treagust, 1989; Taber, 2001b; Özmen, 2004). Some efforts to improve analyse student comprehension of chemical bonding with students of these ages have been carried out in Spain (de Posada, 1999) and in some Latin American countries (García & Garritz, 2006) by using a careful design of new teaching strategies, but literature is not found on any actions of this kind taking place in Spain. Aligned with this situation, the current study shows a new approach for teaching this concept designed for and tested with 1st year high school students of the Spanish Education System. Chemical bonding is part of the Spanish Chemistry curricula in the second cycle of Compulsory Secondary Education (ESO, 14-16 year students) and also in the two courses of “bachillerato”, or Non-compulsory Secondary Education (ES, ages 16-18). Although it is part of the chemistry curriculum in compulsory education, Chemistry as a subject is elective, what means that not all the students do take Chemistry. The concept is faced with different depth in curricula of the subject called Physics and Chemistry (ESO) or in the subject named just Chemistry (ES). But in all the cases teacher purpose is to make students realize that chemical bonds determine measurable macroscopic properties of substances. However, most of the teachers/students fail in reaching this understanding and in driving conclusions that connect microscopic bonds with macroscopic properties (Nahum, Mamlok-Naaman, Hofstein & Krajcik, 2007). The chemistry-teaching community identifies bonding as one of the most important concepts in chemistry, but they realize that this is not properly understood by students. This is a fact not only at the high school level but also in first year college students (freshmen). Experts consider the reason for this could be the lack of effectiveness of the way it is traditionally taught and name it as the traditional pedagogical approach (Nahum et al., 2007). This pedagogy is characterized by simplification. It considers elements classified as metals, nonmetals, and semimetals, and compounds as combinations between elements, being covalent between nonmetallic elements, and ionic between a metal and a nonmetal. Moreover, many chemistry books at pre-university level and even at university level (college level) don’t relate to hydrogen bonds or to van der Waals interactions as chemical bonds (Nahum et al., 2007). They are not considered apart from chemical bonds by all the scientist because they all share the electrostatic nature that aggregates particles to make more condensed phases (Hurst, 2002). As Nahum et al. (2007, p. 581) say "the teaching of this concept is often too simplistic, and it seems that this simplification doesn’t entail student comprehension of the concept". - Atoms need to have octets in the outermost shells. - Atoms tend to share, loss or gain electrons in order to reach the octet. - In a lattice, interactions are only present between atoms shown in the chemical formula of the compound but not among neighbours in all directions. - Bonds are determined by valence electrons. - Ionic compounds are represented as molecules without taking into account that they are structured as an ionic lattice. - Intermolecular forces are not chemical bonds. Similarly to other authors these ideas are considered by us as misconceptions (Nahum, Mamlok-Naaman, Hofstein & Taber, 2010) because they don’t have to do with a global comprehension and interpretation of chemical bonding: The students do not identify the electrostatic nature of chemical bonding. The fact that students don’t relate macroscopic properties with microscopic particles and the electrostatic nature of the forces among them in solids is caused by the confusing way it is presented in textbooks and the idea of “teaching this concept” that the teachers have mainly based in this written material. The main goal of this study is to develop a New Teaching Approach (NTA) for chemical bonding to be taught to 1st year high school students in the Spanish Education System intended to improve their understanding of the concept. 1. What is crucial to take into account to design a NTA for these students? 2. Can a better understanding be reached with a NTA? To answer these questions we carried out the current study. The used methodology has been qualitative and quantitative: qualitative respecting the design of the NTA dealing with chemical bonding, and quantitative regarding the testing of effectiveness of this NTA. Two 1st year high school student groups have been selected. Because teachers follow a similar time sequence in covering the chemistry curriculum, they have been taught by two different teachers supporting these experiment with the researchers. During the experiment they have been in narrow contact between them and with the researchers in order to assure the control of the implementation and the teacher variable. The NTA has been implemented with one of the groups (experimental group, EG) while the traditional teaching approach (TTA) has been used with the other student group (control group, CG). Both groups amounts similar number of students: 23 students the EG and 25 students the CG. The class sessions are 55 minute long and the number of them for each step (see appendix 2) is 3 for Step 1; 5 for Step 2; 2 for Step 3, 2 for Step 4; 2 for Step 5; 1 for Step 6 and 4 for Step 7. They have been carried out in the spring semester, from January to April. According to Spanish chemistry curriculum, 1st year high school students have previously studied some elementary chemistry notions in 3rd and 4th level of Compulsory Secondary Education (ESO). It means that students must know about the electrical nature of matter and must have certain initial knowledge of chemical bonds. In order to measure the knowledge acquisition with our NTA we design a test (seeappendix 1) consisting of 24 multiple choice questions. This test was prepared by the authors after the analysis of literature on difficulties in teaching-learning chemical bonding (Özmen, 2004), students’ preconceptions. (Pérez, Felipe & Moliní 2012) and the professional experience of the authors. The test was used to check student understanding of chemical bonding after being taught this topic. The school principal was informed about the aim of the study as well as the students. They accepted to answer it and consented freely. The test was delivered to students in both EG and CG. The results are recorded in an anonymous way, the student answers analysed and compared between EG and CG in terms of deep comprehension of chemical bonding. Design of the New Teaching Approach. The design of the NTA was based on studies previously carried out by other researches (Leach & Scott, 2002; 2003). In the NTA we define the learning objectives (LO) in a first step, and, secondly the content sequences, in order to reach the learning objectives. After that, one set of test questions was assigned to each learning objective and activities are prepared intended to help students reach the LO. - Learning objectives: to specifically determine what students are expected to know and the sequence in the achievement of the targets. - Activity planning, based on the structure proposed by Leach and Scott (2003), including initial activities, development, experimental activities and assessment. Due to the fact that there is no literature about the Spanish case, the design of the NTA has been made by taking into consideration the experiences carried out in other countries (Leach & Scott, 2002; 2003; Nahum et al., 2007; Nahum et al., 2013; Lee & Cheng, 2014), our previous analysis of the way chemical bonding is introduced in Secondary Education Spanish Chemistry textbooks and another analysis of Chemistry textbooks in schools carried out by Bergqvist et al. (2013). The conclusions driven from our previous study (Pérez et al., 2012) is that in school textbooks the treatment of chemical bonding differs mainly in Content Sequence (CS), Vocabulary used (V), classification of substances by Kind of Chemical Bonds (KCB), and consideration of Intermolecular Forces as Chemical Bonds (IFCB). Those will be crucial points respecting our NTA design. The NTA has been designed based upon the model proposed by Taber and Coll (2002) and Bergqvist et al. (2013) but introducing some modifications. The NTA begins with the study of some “real-world” chemical reactions and explaining that bonds are broken and formed during chemical reactions thus leading to new substances with new physical properties. Then the properties of different substances are studied because one of the purposes of the model is to justify properties of substances by making use of bond concepts. Similarly to the model proposed by Taber and Coll (2002), the NTA is based upon the effect of electrostatic forces for all types of bonding, and minimizes the use of the octet rule or electronic configuration. We proposed to change the order in the introduction of the types of bonding by teaching ionic bonding first, followed by metallic bonding and, lastly, covalent bonding (see Steps in appendix 2). Regarding covalent bonding, we started with solids in a covalent lattice, continued showing discrete molecules and ended with intermolecular bonds. Appendix 2 includes the NTA. There, it is emphasized the electrostatic nature of chemical bonds and the fact that ionic bonding is not considered simply as an electron transfer (Taber & Coll, 2002) over all in Step 7. The comparison between the NTA and the traditional one respecting these 4 crucial points indicated in the paragraph above is shown in table 1. Table 1: Comparison of TTA and NTA according to the crucial points observed. -Classification of substances and properties of substances. -Introduction of Properties of Substances. -Introduction of Crystal Solids and its different constituent particles (atoms, ions, molecules). -Use of different words for “crystal structure solid”: crystal solid, crystal, atomic or reticular lattice. -Different nomenclature used for different types of solids. -Use of the word “solid substance” with reference to its constituent particles like ions, atoms, or molecules. -Classification of bonds in ionic, covalent and metallic. -Consideration of several kinds of covalent bonding for very different compounds, never including substances like solid iodine or water. -Classification according to constituent particles: ionic substances when ions, molecular substances when molecules, atomic substances when atoms, and metallic substances when metals. -Consideration apart from chemical bonding. -Molecular solids are not included. -Consideration of Intermolecular Forces as chemical bonds due to its electrostatic nature. The NTA learning objectives (LO) indicated in table 2 were determined according to the 4 crucial points included in table 1. Table 2: LO of the NTA and associated test questions. The proposed activities are directed to help students reach these LO. They can be seen in appendix 2. With the NTA we try to motivate students through hands on activities; overtake the difficulties related with learning chemical bonding; help students relate to chemical bonding and macroscopic properties of substances; be aware of the electrostatic nature of chemical bonding; and lead students use their acquired knowledge to interpret their environment. We followed seven steps in the implementation of the NTA in order to help students achieve the pursued LO. After that, we were able to measure student understanding with the ad hoc prepared test. As it was indicated above, we delivered the test to EG and CG after teaching students in both groups the topic of chemical bond, by implementing the NTA in the former and the TTA in the latter. The questions in the test were assigned to the LO as shown in table 2.. Learning objective number 1 (LO1) is a general objective related with conceptualization and authors assume it is achieved after succeeding in the test as a whole. Student answers to test questions in EG and CG are compared. The comparison of collected answers is shown in appendix 3, and Figure 1 and Figure 2 in the next section show the comparison between EG and CG for the six LO. 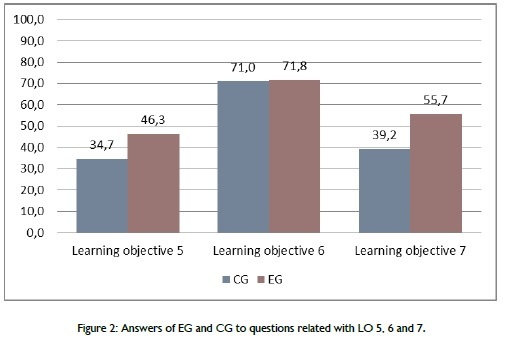 Figure 1 shows the results of the questions in the test regarding LO 2, 3 and 4 for EG and CG. Students in EG gave less correct answers to the questions related with LO2 (To know physical and chemical properties of the substances) than those in CG, but this short difference is not significant. Students in EG gave more correct answers to the questions related with LO3 (To identify constituent particles in solids) and LO4 (To relate macroscopic properties of solids with constituent particles at microscopic level and the forces among particles). Taking these results into account, we can say that the NTA favors that students develop deeper comprehension of microscopic and macroscopic properties of substances, and understand better the electrostatic nature of chemical bonding. A deeper analysis of the previous figure let us see that the biggest difference between EG and CG lies in LO3. In this case, students in EG gave 59.8 % of correct answers while those in CG answered right only 28 %. This fact entails for students in this group a better comprehension of microscopic particle composition of solids. It is interesting to go even deeper in the analysis of the answers to questions related with this LO (see table 2) to remark the case of question number 20: 74% students in EG answered correctly the particles that constitute sodium chloride, while in CG only 24% of students gave the correct answer. We assign the big difference particularly in this question to the materials and design prepared for Step 3 in the NTA. It consists of several activities among which is the projection of videos and slides including structures of different solid crystals, focusing on constituent particles. It provides students with a visual framework, favoring the formation of their own models for learning. LO4 is the one that involves relationships between macroscopic properties and microscopic bonds, and is one of the key points considered by the authors in order to achieve a deep understanding of chemical bond. In this respect, we see better results for students in EG, 52.2 %, than for those in CG, 45 %. Therefore, going deeper to the results in each question composing this LO (table 2) we observed that, in spite of the fact that students in EG gave more correct answers to question 24, it is CG that gave better results in question 23 (36% vs 21,7% in EG), while for questions number 9 and 17 both did similarly right. We try to manage the achievement of connection between microscopic structure and macroscopic properties in the NTA by introducing activities where students were required to classify different substances based on macroscopic properties, put them in a table, make another classification in terms of constituent particles, relate it with the previous one, and show conclusions in a mind map (activity 15 and 16, Appendix 3). The results on correct answers to these questions is better in EG; nevertheless, it is less than 50%. This fact lead us to conclude the hardness found by students in relating microscopic information (constituent particles and forces among them in solids) and macroscopic information (properties) of the same solid substance. Figure 2 shows the results concerning LO5, 6 and 7. Respecting LO5 (To identify the reason for bond formation with lowering of energy), 46.3% of students in EG answered right, while 34.6% of students in CG did. A similar result is observed by other researchers when dealing with the relationship between bond formation and energy (Becker & Cooper, 2014). Among the questions composing this objective, it is important to remark the answers to question number 2 that deals with the reason for bond formation: in EG, 52% of students gave right answers while only 36% did in CG. In addition to that, it is also remarkable that out of the 48% of students in EG who didn’t answer it right, 80% considered the gain or the loss of electrons as a reason for bond formation. Moreover, it is remarkable the scarce number of right answers to question 21, 8.7%, in EG and about half, 4%, in CG. We find that this results reflect the fact that students don’t realize the role of energy in this process. On the contrary, they rather tend to apply and remember simple rules like the “octet rule” or the “trend to reach the closest noble gas electron configuration” as reasons for bond formation. In question number 12 students must just realize which atoms are metals and which are non-metals, so classify them in these two categories, and it is better done by CG students. But when asking about the possible combination among the elements in these two categories (question 13), students in EG did better, what we interpret that shows a deeper understanding of chemical bond. The TTA shows a dichotomy regarding chemical bond: ionic bond for metal-non-metal combination, covalent bond among non-metals, and studies the two kind of bonds as completely apart entities. This classification may lean students just memorize and therefore rise the number of correct answers without actual comprehension of chemical bond formation. However, NTA emphasizes in showing chemical bonds among atoms, no matter whether atoms are metals or non-metals, as different kind of electrostatic forces, what implies a deeper comprehension of bond formation. A general insight into the implementation of the NTA let us conclude that students in EG succeeded a higher number of times in questions related with all LO except with LO2. The analysis of answers to the 24 questions composing the test let us say that, although students in CG answered better to 7 questions, students in EG did better in more questions, 17, what implies that students in the latter group, EG, answered significantly better to the test as a whole. In addition to that, we compared percentages of students who answered right in the questions: 44.2% of students in CG did versus 55.7% of students in EG. Due to the fact that our student sample has n<30, we have applied a t-student test to the comparison of correct answer percentages. It can be said that in EG students answered more correctly about chemical bond than CG students with 99.5 % confidence level. From all this collected information we would say that the NTA help students understand better the topic of chemical bonding than the TTA. However there are some issues in the complete comprehension of chemical bond that are not achieved by students neither with the traditional approach nor with this NTA, like how a bond is produced and the identification of the reason for bond formation with lowering energy and increasing stability. Therefore, the NTA needs to be improved intending to overtake the weakest points still detected in students understanding of chemical bonding. At the moment, the NTA has been implemented only for one academic year. Therefore, we show in this work only preliminary results. More research is clearly needed. It is our intention to improve the design of NTA and the test, and continue the research in the coming years. The research questions posed have been answered. Regarding question 1, it has been designed a NTA for the teaching of chemical bonding including the mixing of content and teaching activities. The four crucial aspects found around which NTA has been designed are: Content Sequence, Vocabulary, Classification of substances by Kind of Chemical Bond, and consideration of Intermolecular Forces as Chemical Bonds. The NTA consists of a sequence of activities emphasized in the study of chemical reactions, and the relationship between microscopic structure and macroscopic properties of substances. After the implementation of NTA and measurement of its effectiveness with the test, we can say that students in EG reached better results than those in CG in LO3, LO4, LO5 and LO7. They find nearly same results as students in CG in LO6, and only in LO2 students in EG achieved worse results. Considering the test as a whole, students in EG answered better than those in CG with 99.5% confidence. From that, we can say that the NTA is more effective than the TTA for teaching chemical bonding, which answers research question 2. Some weaknesses have been observed after analysis and use of NTA and the tool designed to measure its effectiveness: the test. Firstly, regarding the latter, no questions about metallic bond have been included. Secondly, although in step 7 we try to clarify the electrostatic nature of chemical bonding, it is finally not enough emphasized due to the lack of questions in the test regarding this issue. In addition to that, although the average of right answers in EG is higher than in CG, 55.7% vs 44.4%, this percentage is just slightly above half the students. Going deeper in the causes for that we find the following: still some questions do have a level of right answers lower than 50% for students in EG. This is the case of questions 15 and 16, which shows that the hardness found by students relating microscopic particles and macroscopic properties of the same solid substance is not yet properly handled in NTA. In this group of low rates of right answers, questions 2, 5 and particularly 21 are found, all related with the identification of bond formation with lowering energy and increasing stability. It means that NTA still needs to be improved in terms of emphasizing the electrostatic nature of chemical bonds, helping students understand the role of energy in bond formation, and avoiding the interpretation of ionic bonds as electron transfer. The test must be modified by introducing questions about metallic bonds and the electrostatic nature of chemical bonds. After this changes, a new study parallel to the current one could be done in order to check student understanding of the topic. We acknowledge the school and students participating in the project and the professors who collaborate with interesting suggestions. Becker, M., & Cooper, M. (2014). College Chemistry students’ understanding of Potential Energy in the context of Atomic-Molecular Reactions. Journal of Research in Science Teaching, 51(6), 789-808. Bergqvist, A., Derchsler, M., De Jong, O., & Rundgren, S. N. C (2013). Representations of chemical bonding models in school textbooks – help or hindrance for understanding?, Chemistry Education Research and Practice, 14(4), 589-606. De Posada, J. M. (1999). Concepciones de los alumnos sobre el enlace químico antes, durante y después de la enseñanza formal. Problemas de aprendizaje. Enseñanza de las ciencias: Revista de investigación y experiencias didácticas, 17(2), 227-245. Driver, R., & Oldman, V. (1986). A constructivist approach to curriculum development in Science. Studies in Science Education, 13(1), 105-122. Felipe, E., Moliní, A., & Pérez, C. (2012). El concepto de enlace químico en los libros de texto: Dificultades de aprendizaje detectadas. In J. M. Domínguez Castiñeiras (Eds. ), Actas de los XXV Encuentro de didáctica de las Ciencias Experimentales (pp. 381-390). Santiago de Compostela: Apice. Fensham, P (1975). Concept formation. In D. J. Damels (Ed), New movements in the study and teaching of chemistry (pp. 199-217). London: Temple Smith. Gabel, D. (1996, July). The complexity of chemistry: Research for teaching in the 21st century. Paper presented at the 14th International Conference on Chemical Education, Brisbane, Australia. García, A., & Garritz, A. (2006). Desarrollo de una unidad didáctica: El estudio del enlace químico en el bachillerato. Enseñanza de las Ciencias, 24(1), 111-124. Gillespie, R. J. (1997). The great ideas of chemistry. Journal of Chemical Education, 74(7), 862-864. Griffiths, A. K., & Preston, K. R. (1992). Grade-12 students’ misconceptions relating to fundamental characteristics of atoms and molecules. Journal of research in Science Teaching, 29(6), 611-628. Hurst, O. (2002). How we teach molecular structure to freshmen. Journal of Chemical Education, 79(6), 763-764. Leach, J., & Scott, P. (2002). Designing and evaluating Science Teaching Sequences: An approach drawing on the Concept Learning Demand and a Social Constructivist-Perspective on learning. Studies in Science Education, 38, 115-142. Leach, J., & Scott, P. (2003). Individual and sociocultural views of learning in science education. Science & Education, 12, 91-113. Lee, R, Cheng, M. M. W. (2014). The relationship between teaching and learning of chemical bonding and structures. In C. Bruguière, A. Tiberghien & C. Pierre (Eds. ), Topics and trends in current science education: 9th ESERA Conference Selected Contributions (pp. 403-417). Dordrecht: Springer. Nahum, T. L., Mamlok-Naaman, R., Hofstein, A. (2013). Teaching and learning of the chemical bonding concept: Problems and some pedagogical issues and recommendations. In G. Tsaparlis & H. Sevian (Eds), Concepts of matter in science education (pp. 373–390). Dordrecht: Springer. Nahum, T. L., Mamlok-Naaman, R., Hofstein, A., & Taber, K. S. (2010). Teaching and learning the concept of chemical bonding. Science Education, 46(6), 179-207. Özmen, H. (2004).Some students misconceptions in Chemistry: A literature review of chemical bonding. Journal of Science Education and Technology, 13(2), 147-159. Pérez, C., Felipe, E., & Moliní, A. (2012, July). Concepciones alternativas de los alumnos de Educación Secundaria sobre el enlace químico. Influencia de los libros de texto de química. Paper presented at the VII Reunión de Innovación Docente en Química (INDOQUIM 2012), Barcelona, Spain. Peterson, R. F., & Treagust, D. F. (1989). Grade-12 students’ misconceptions of covalent bonding and structure. Journal of Chemical Education, 16, 40-48. Robinson, W. (2003). Chemistry problem-solving: Symbol, macro, micro, and process aspects. Journal of Chemical Education, 80, 978-982. Taber, K. S. (1998). An alternative conceptual framework from chemistry education. International Journal of Science Education, 20(5), 597-608. Taber, K. S. (2001a). Building the structural concepts of chemistry: some considerations from educational research. Chemistry Education: Research and Practice in Europe, 2(2), 123-158. Taber, K. S. (2001b). Shifting sands: A case study of conceptual development as competition between alternative conceptions. International Journal of Science Education, 23(7), 731-753. Taber, K. S., & Coll, R. (2002), Chemical bonding. In J. K. Gilbert, O. De Jong, R. Justi, D. F. Treagust, & J. H. Van Driel (Eds. ), Chemical education: Towards research-based practice (pp. 213-234). Dordrecht/Boston/London: Kluwer Academic Publishers BV. Taber, K. S., Tsaparlis, G., & Nakiboğlu, C. (2012). Student conceptions of ionic bonding: Patterns of thinking across three European contexts. International Journal of Science Education, 18(34), 2843-2873. doi:10.1080/09500693.2012.656150. Teichert, M., & Stacy, A. (2002). Promoting understanding of chemical boding and spontaneity through student explanation and integration of ideas. Journal of Research in Science Teaching, 39(6), 464-496. Tsaparlis, G. (1997). Atomic and molecular structure in chemical education. Journal of Chemical Education, 74, 922-925.
d. They tend to a minimum energy state. d. When melted, the compound will be a good electricity conductor. a. Atoms are the same kind. b. Atoms are different between them. c. Joined atoms form a more stable system than when they are apart. b. Transferring one electron from each sodium atom to each fluorine atom. c. Sharing a pair of electrons, one from sodium atom and the other one from fluorine atom. d. Sharing a pair of electrons, both from sodium atom. a. Solid, insoluble in water and no electricity conductor. b. Liquid, insoluble in water and no electricity conductor. c. Gas, insoluble in water and no electricity conductor. d. Gas, soluble in water and no electricity conductor. d. Are good electricity conductors. a. Unit cells in metal lattices are formed only by positive ions. b. Unit cells in metal lattices are formed by positive and negative ions. c. In a few metals, unit cells are formed only by negative ions. d. Unit cells in metal lattices are formed by positive ions and neutral atoms. a. Atoms bond to reach a noble gas electron configuration. 1. To explain what is a chemical reaction, kind and how it takes place by means of performing chemical reactions in a laboratory. 2. To classify substances regarding solubility, electrical conductivity, melting and boiling point, after experimenting with them. 3. To draw internal structure of substances to support the analysis of (experimentally determined) behavior in order to identify constituent particles. 4. To conclude that macroscopic properties of substances are determined by bonds among particles. 5. To identify the reason for bond formation with the lowering of energy. 6. To identify the different kinds of bonds. 7. To analyze the different kinds of bonds in terms of the nature of forces. It will be introduced what is a chemical reaction, how it takes place by breaking down bonds in reactants and building new ones in products. An example will be proposed where ball molecular models have to be used to show the bonds broken in reactants and those ones built in products. Student answers to questions 4 and 5 are used as starting points for developing this step. 1. What is a chemical reaction? Give an example explaining what happens and draw the process. 2. A video on chemical reactions is watched. 3. The combustion of methane is used to be represented by means of molecular models. 4. Do you think that reactants and products have different properties because atoms are combined in a different way? Why? 5. How do you know that a chemical reaction has taken place? Would you relate chemical change with chemical reaction? Use a model to represent the combustion of methane, different from the one that uses chemical formulas, and figure out the microscopic process. Macroscopic physical properties of solid substances will be analyzed by means of an experiment. The properties to be analyzed are electrical conductivity, solubility, melting and boiling point. Based on the values of these properties the substances will be classified and differences among them will be identified. 6. Laboratory Experiment. Theoretical introduction. 11. Make a table showing values of these properties and comparing values among them. Plots of the analyzed solids will be used in order to identify constituent particles in each solid category. 12. Projection of structures of crystalline solids and relationship of different structures with the target substances. To connect macroscopic properties of substances with microscopic particles and forces among them, we start from student answers to question 13 and 14. 13. Do you think the microscopic structure of substances has to do with the macroscopic appearance and the macroscopic properties? 14. Do you think that macroscopic properties of substances have something to do with internal forces among particles? Give an example with the analyzed properties. 15. Students are required to compare the categories made by considering macroscopic properties and those obtained by considering constituent particles. 16. Students are required to make a concept map showing conclusions up to this moment. 17. Provided that CO2 has a low melting point and doesn’t conduct electricity, what kind of solid it is and what are its constituent particles? Provided that diamond doesn’t conduct electricity and has a high melting point, what kind of solid it is and what are its constituent particles? By starting from student answers to question 18, they performed point 19. 18. Why do you think atoms, molecules or ions bond together? Would you identify particles in a solid by means of macroscopic properties? 19. Stability plot and forces in bonds are analyzed by students. We start this step with this question: What do you think are stronger forces that keep molecules together in a molecular solid or those that keep ions together in an ionic solid? 20. Classify the next substances as ionic, molecular, atomic or metallic. .
All chemical bonds of any type are presented as the effect of electrostatic forces and the reason why bonds are formed in terms of energy change and not in terms of the octet rule or electronic configurations. 1. Analysis of sodium chloride formation from the lattice structure and not presented in terms of electron transfer. 2. Analysis of metallic bond: Different models for metallic bond are presented as different entities to explain the facts and the metal properties. 3. Analysis of covalent bonding and Lewis plot of solids by starting with the covalent lattice before discrete molecules to avoid presenting covalent bond in terms of just sharing electrons. 4. Analysis of intermolecular bonds considered as the weakest bonds.